Pierre DeRoche has combined the most advanced mechanical watchmaking with subtle musical poetry in its latest creation, the RendezVous, which displays a double gong under the sapphire crystal. 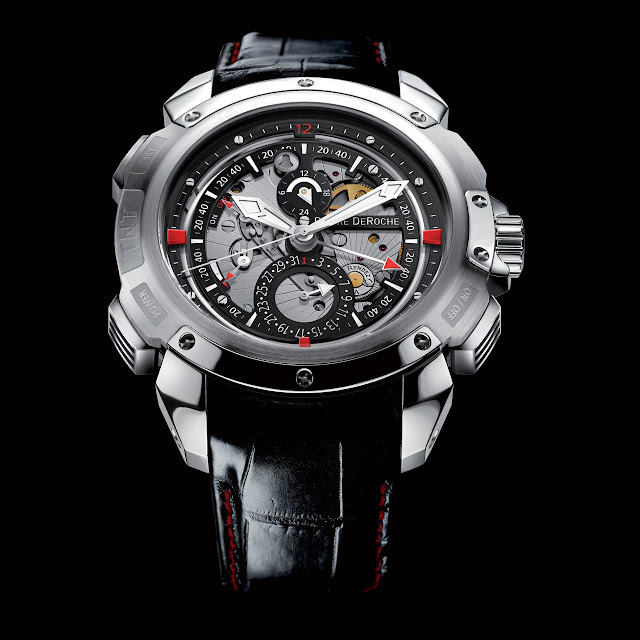 Coupled with the striking-mechanism’s on/off function, this device is unique on this kind of watch and gives this exceptional timepiece its intrinsic value. When the alarm is released, the mechanism reveals its secrets: first, the fast-and-slow, then the striking mechanism’s bridge moving into action, and finally the hammers successively striking the two “Chartres” chimes (cathedral inspired, the two gongs turn more than 360° but are of different lengths). With a few clear, limpid notes produced by the best watch craftsmen from the Joux Valley, the RendezVous will remind you of your day’s appointments. Series limited to 201. Movement Automatic, exclusive Dubois Dépraz calibre,32 jewels,decorated and engraved, circular (360°) rotor, sunray-pattern bridges. Functions Hours, minutes, seconds, date, day/night indicator, RendezVous function with 2-gong striking mechanism, winding and On/Off indicators. Case Black PVD titanium container; screw-down crown, bezel and horns crown guard and pushpieces all in steel, 45.5 mm. Double-sided anti-reflective sapphire crystal and sapphire back. Water-resistant to 100 m.
Strap Alligator with folding clasp. Other version Limited series of 21 pieces in pink gold (18K), steel and titanium.